The new events in that small village began to unfold. The Holy Virgin Mary has appeared to Glafiria in a dream every Friday. The woman was conscious during her sleep and had conversations with the Most Holy Virgin. The Mother of God allowed to move the prayer site further away from the border, to the place where the miraculous light had appeared for the first time. Firyja marked the new place with stones found nearby. The next day, water began to flow out from under the stones. The news about the next miracle on the Mount Jawor spread quickly. The faithful from the neighbouring villages began to come there to ask for a grace of healing for themselves or their relatives. They drank the water with worship and faith, and oftentimes they were healed thanks to their faith. That was the case of a woman from the nearby Slovak village of Cyhelka (now Cigel'ka). She was possessed by an evil spirit to the point that they brought her to this sacred place bound with chains. Her husband was asking Firyja to intercede with God on behalf of her. Firyja said a prayer and washed the poor woman with water from the spring. The woman has been healed and, freed from her bonds, returned home on her own. In a short time, the well has been dug in the place of the spring. The well has been covered with roof, and nearby, according to the wish of the Mother of God, a stone cross has been set up, having a figure of the Virgin Mary at its base. The worship on the Mount Jawor was constantly increasing. The time has finally come to build a chapel. The pious visionary, at the request of the Mother of God, went with this mission to the local parish rector, priest Andrzej Dorosz. She heard, however, his strong refusal, as well as many bitter words at her own address. What else could she do? The humble widow once again turned to her Protectress for help. She was warned of a sign to be given to the priest - he would suffer a bleeding from his mouth. Priest Dorosz yet disregarded this warning the same way he earlier did with the news about the miraculous events on the Mount Jawor. However, when the bloody prediction has been fulfilled and became known to the people of Wysowa, the priest felt so deeply ashamed that he couldn't find any solution besides request for transfer to another parish. 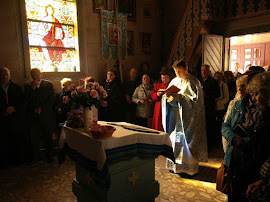 Priest Dorosz has then been transferred to the village of Banica, located not far away, while in his place appeared a young priest, Mikolaj Duda, for whom the Wysowa parish was his first one. He was a reasonable and moderate man. Having received certain legal education, in addition to theology, he was sceptically oriented to unverified informations. Naturally, the simple woman didn't manage to convince the recent seminary graduate about the truthfulness of the miraculous events that took place somewhere in a forest near Wysowa. Once again, a sign was necessary. This time, Firyja passed a warning about animal plague in the new priest's household. Thus, on one night a sheep died, followed by a cow on the next night. The priest realised that those events were not accidental. He checked the animals for any signs of disease and searched for signs of someone's malicious activity in the household. He didn't find anything suspicious. Nevertheless, his horse died on the next night. Now it became clear to priest Duda that the plagues weren't caused by earthly factors, but they were rather signs confirming truthfulness of Firyja's testimony. This way, the priest Duda's support for the chapel construction project has been gained. The construction plans were facing all new obstacles. Due to the location being in immediate vicinity of the state border, special permissions were required. The case seemed to be lost - a worship object attracting multiple visitors, located just three hundred meters away from the Czechoslovak border, appeared to be unacceptable by both the local and the central authorities in Warsaw. On the initiative of the parish rector Duda, the Metropolitan Archbishop of Lviv, Andrzej Szeptycki, and even the Pope Pius XI have been involved in this matter. The letter from Rome addressed to Polish authorities indicated that religion knows no boundaries. The authorities demanded then convincing evidence of the Mount Jawor apparitions. It happened that the wife of the border guards commander in Wysowa, Jan Nowak, decided to visit the Mount Jawor together with her four-year-old son, Franciszek. They went to Glafiria asking her to walk them up to the holy place. Glafiria willingly agreed and they set out immediately. Having arrived to the place, where the stone cross was already set up, they kneeled down and started their prayer. And suddenly, quite unexpectedly, they heard the boy crying "I won't give them up! I won't give them up! ", while he was hiding the flowers that he had collected on his way up. Answering the questions of his anxious mother, he explained that he didn't want to give the flowers up to an unknown lady, as those flowers were brought for the Mother of God. No one else was present there at that time. In this unimaginable way the new witness has been found. The four-year-old Franciszek was later questioned in different ways about the events that took place on the Mount Jawor. Eventually, thanks to the testimony of a child whose brain would not be able to invent such a credible lie, the Gorlice county authorities issued permission for the construction of the chapel. The Immaculate Virgin gave recommendations on how Her chapel icon should look like. The painting of the icon has been committed to the architect of the constructed chapel, professor Stefan Batiuk. After the second failed attempt of painting the icon in the recommended form, the Mother of God directed Glafiria to the Basilian Fathers Monastery in Lavrov, by Staryi Sambir (now located in Ukraine, ten kilometers past the Polish border). There, among some old books, she was supposed to find a picture to be used as an example by the professor. The search of the picture in the monastery lasted long, as no one ever heard about the book requested by Glafiria. Only after a long time they came across the book in question. The picture showed the Virgin Mary holding the Christ Child with her right hand. This was a very rare representation of the Virgin Mary, as the Christ Child is almost always represented being held with His Mother's left hand. Having received this rare picture, the pious widow departed on her two hundred kilometer long way back. In spring 1929 the chapel construction started. The location was hardly accessible. The timber had to be transported from distant places. The construction works proceeded slowly, but steadily, until the moment when, after the half roof has been covered with shingles, the funds have finished. That construction money had been donated by pilgrims thankful for the graces they had received through the intercession of the Virgin Mary. However, unexpectedly, another donation came in, from a former inhabitant of the nearby village of Ropki. That woman had migrated to America years ago, and now, having found out about the chapel being built on the Mount Jawor, she sent her fifty dollar money order for that purpose. In this remarkable way the construction works have been completed. Now the chapel consecration needed to be performed. In that time, a message came from the town of Przemysl, from the bishop Jozafat Kocylowski. The bishop invited Glafiria for a week long examination, aiming to confirm the true nature of the apparition and the weekly visions. As it turned out later, a psychiatric evaluation was also included in that visit. In the end, bishop Kocylowski in person heard confession of the visionary from Wysowa. The final evaluation of truthfulness of the Mother of God apparition to Glafiria Demianczyk was positive. The Chapel consecration took place on the feast of the Protection of the Mother of God (Pokrov), 14th of October 1931. The solemn Divine Liturgy has been celebrated by bishop Kocylowski. Two indulgence feasts have been instituted: on the feast of the Protection of the Mother of God (Pokrov) and the feast of the Translation of the relics of the Saint Nicholas the Wonderworker, on 22nd of May - the month especially dedicated to the Mother of God.